457 in stock Need More ? Translated by Constance Garnett with an Introduction and Notes by Dr Keith Carabine, University of Kent at Canterbury. Crime and Punishment is one of the greatest and most readable novels ever written. 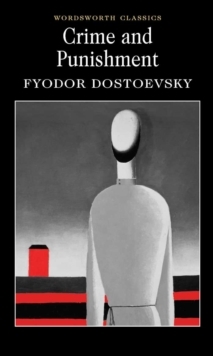 From the beginning we are locked into the frenzied consciousness of Raskolnikov who, against his better instincts, is inexorably drawn to commit a brutal double murder. From that moment on, we share his conflicting feelings of self-loathing and pride, of contempt for and need of others, and of terrible despair and hope of redemption: and, in a remarkable transformation of the detective novel, we follow his agonised efforts to probe and confront both his own motives for, and the consequences of, his crime. The result is a tragic novel built out of a series of supremely dramatic scenes that illuminate the eternal conflicts at the heart of human existence: most especially our desire for self-expression and self-fulfilment, as against the constraints of morality and human laws; and our agonised awareness of the world's harsh injustices and of our own mortality, as against the mysteries of divine justice and immortality.